Setting the stage for a ferret, do not expect it meekly cringing - this is not the case. The location will have to seek. But it's worth it, because your life will significantly change the world in such a fussy, excessively curious, and incredibly cunning and intelligent animal. 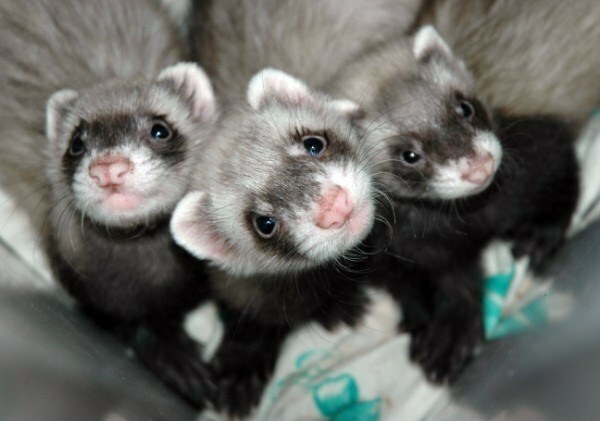 All you have to do is to give the ferret the right conditions, which vary depending on age. How can you define it? Please note the fur of the ferret. Puppy at the age of 1.5 months is covered by the children's hair gray. Puppies are a little older (2-3 months) color, as a rule, already manifested or is in the process of manifestation. Compared to adults puppies ferret covered with soft fur, pleasant to the touch. As an adult, ferret fur is quite rough. The difference is the same as that between the hair-year-old child and an adult male. Inspect the teeth of a ferret. Indigenous begin to erupt from him in 1-1,5 months of age puppies have baby teeth. At the age of three months, the puppy has already a full-fledged fangs, white and sharp. They remain similar to a year. In the period from 1.5 to 2.5 years, the tips of the fangs become yellowish and translucent. In 3-4 years, the transparency of the fangs of a ferret will be much more obvious and spread over a large area of the teeth. Around 6 years fangs already fully yellow, and the lower jaw, you may notice the absence of several small Zubkov. Teeth adults usually have stnanosti. Follow the behavior of the ferret. Young individuals are characterized by their hyperactivity and playfulness. Adult ferret plays much less, has a lower mobility, tires easily, and therefore constantly sleeping. Muscles older ferret loses its tone, the fur thins and noticeably thinner, often balding is the tail. There are problems with the teeth, the animal becomes difficult to chew and chew. In the period from 4 to 6 years in elderly individuals ferret often develop severe disease of the adrenal glands, heart and so on Ferret age are also prone to blindness and deafness. It is on the behavior of ferret you should pay attention to when buying females ferret, as is often the case that customers sell the adult female, giving her 3-month-old puppy.